is often a helpful tool in shaping our concepts. as well the school system and home education. When we began home education, I tended to see ‘The Government’ as some huge ogre with ultimate power that was potentially threatening to me and all I held dear. The truth of the matter, however, is that we live in a democracy, and our laws (and their administration) are supportive of individuality within the confines of common decency and responsibility. What we wanted to do, educating our child at home, thankfully proved to be well within the confines of the law. The following diagram is not intended to be a precise or official representation of our entire system of government. Rather, its aim is to provide a general idea of why home education is every bit as valid an educational choice as a school within either the public or non-government school systems. The education of every child within the ACT is governed by the same system, all the way down to what I’ve dubbed the ‘System’ level – below that in the line of authority will be dealt with in separate diagrams further down the page. Laws to provide a structure and an order to the way things are done and how people are allowed to behave towards one another. A group of people to take general care of how these laws are enacted, probably grouping several areas together for ease of management – for the practicality of definition: the bureaucracy. Groups of people (departments) to sort out how everything would all work and administrate it all. A way of doing things (a system) so that the laws were worked out in a manner that was appropriate to the people, and lots of lovely people to keep all that moving along smoothly. Funnily enough, this is pretty much how our democratic society works. Now lets move down through the layers of government to where the laws surrounding the education of our children are being worked through so that they benefit the most children possible. indication of real learning. In other words, it’s a faulty model. 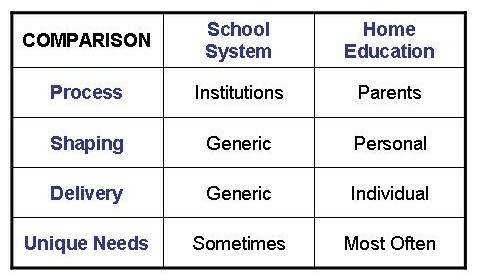 Let’s look first at the School System. This is not meant to be a cynical depiction of the structure that exists. There are a great many very wonderful teachers within the system, doing their very best to genuinely educate the children in their care. At the System level in the diagram below, there are many individuals who are passionate about education and who strive in their roles within the Department to ensure that genuinely productive procedures are in place. This diagram is not meant to denigrate or undermine any of the genuinely dedicated personnel within the education system. It is simply about looking at the focus of this part of the system. 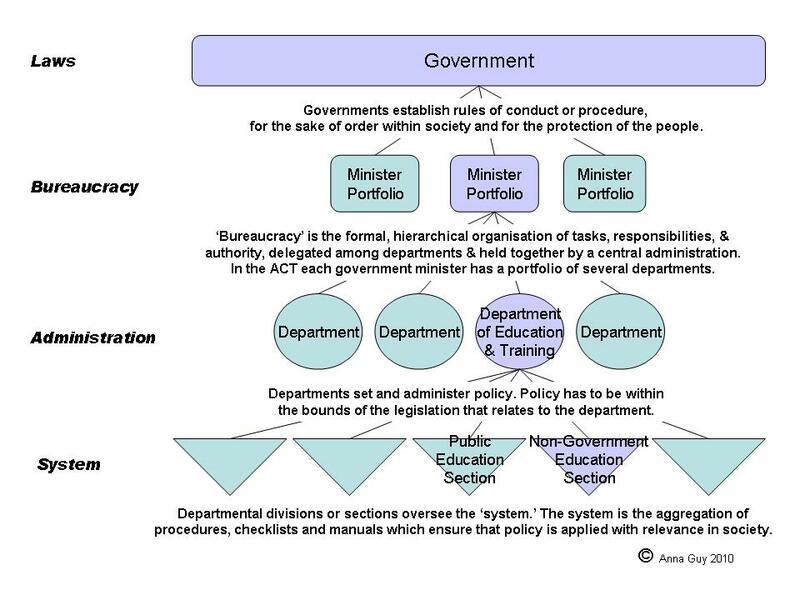 The top of this diagram flows on from the bottom of the Government Model above. The focus of this part of the system is the body of children who are intended to be served by it. The sad reality is that despite the best intentions of a great many individuals, this part of the system has to cater for the mass of children. Chris Davis terms it: ‘the generic child’. Tragically, the generic child often ends up serving the system that is intended to equip and enable him/her. Parents, of course, always care individually and personally for their own child or children. Not one of us has a truly ‘generic child’ – we all have highly individual, unique and wonderful children. Many parents work extremely hard to support their child within the school system, so that every possible benefit is maximised. Where there is good collaboration between school, teacher, parent and child, this can produce an effective synergy that truly does work in the best interests of the child. This collaboration is not always effective, however, even when all parties have done their very best. Home education may be something a family arrives at when the school system has not proved beneficial for their child or children. For many families, however, it is their first choice – a preference right from the start. In the ACT, the Non Government Education Section (NGES) of the Department of Education (DET) looks after all schools which are independent of the public school system. This covers church schools such as Catholic schools or Christian schools, as well as Islamic schools, or schools with particular educational philosophies such as Steiner or Montessori. Home education is also part of this Non Government Education Section. This diagram is not intended to be idealistic. Its purpose is to depict how home education sits within the education system, as well as indicate some of the attitudes and opportunities that can make it a positive education choice for many families. There is no guarantee with any form of education that a child will emerge or evolve in a way that deems the process an utter success. There are always variables, not least of which is the child’s willingness to engage and participate. Home education does, however, provide a wonderful opportunity for a great many children and families, and should not be dismissed just because it isn’t school education – it isn’t, and it shouldn’t be. It is an entirely different educational model. You will notice (above) that once the line of authority comes below the government System level, the education streams differ dramatically. Home education is certainly not for the faint hearted. It’s no easy cop-out in anyone’s book. 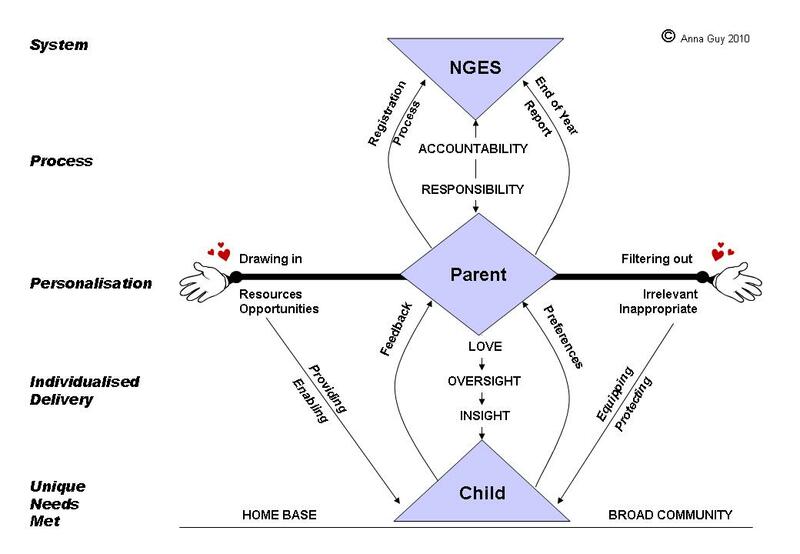 There are unique struggles associated with this form of education, that do not arise in most parent-child, child-teacher or parent-teacher relationships. The wonderful thing is that in home education, your love for one another is able to take priority over task orientation, and both parent and child can emerge from these struggles better, more equipped, and with the relationship even stronger. the chief interest of all technical endeavours.